【Sturdy Solid Wood Construction】7 convenient hooks on the modern coat rack allow users to diy assemble different length and number of layers,easily hang garments and accessories. Example like our main pictures:hang long coats on the top long hooks, shorter jackets, caps, keychains and handbags on the lower hooks. 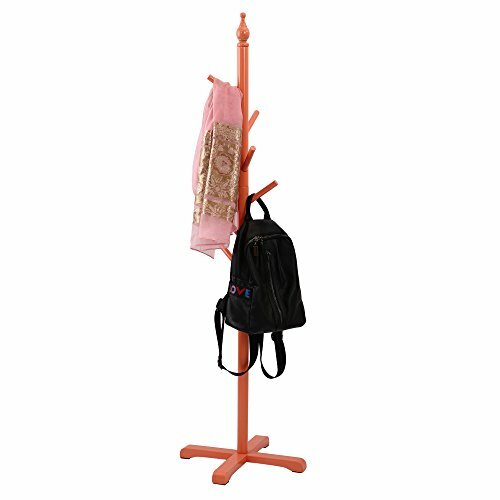 Your idea choice is best for the coat rack tree! 【Human Size and Quality Warranty】The assembled wooden coat tree size is:16.92L*16.92W*55.90H inch, The 16.92inch is the 4 prong legs length as the pictures show,The 55.9inch height suit for almost kids ,adults or teens,easy to hang on or take;Standing rack is water-resistant & easy to clean with a damp cloth,Besides, the coat rack with 24 months warranty.